Anyone who lives in or around Crystal Palace in Southeast London will know Haynes Lane Market. It’s a relic from a by-gone era, a proper flea market selling knick-knacks, antiques, curiosities, records, vintage clothes, ephemera, general gubbins and down-and-out junk. Or, at least, I did. I haven’t been there for years now. Trying to prevent your kids from marauding around rickety shelving units filled with vintage crystal takes a lot of the fun out of the Sunday mooch. But, back in ye olden days, 10 years BC (before Cecily), I regularly went to idly wander the sloping corridors of the old market. And by golly did I find some wonders. Including one fine day when I discovered an entire stall filled with someone’s Haberdashery stock from their old shop. And that’s where I got a bag load of slightly musty smelling Linnen Brilliant yarn from Scheepjes. I kept hold of the yarn for years, used bits of it to make some granny squares and then one day, BINGO! I found the right project for it. And I would have gotten away with it if it hadn’t been that I totally didn’t have enough yarn for that project. I mean, I thought I did. I checked it! I’m sure I checked it. Anyway, somewhere along the way, I realised I didn’t have enough yearn to finish. 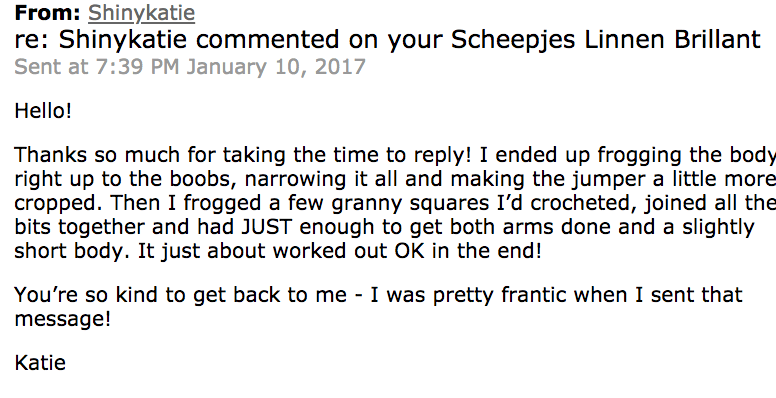 That’s when I started messaging random people on Ravelry who had the right yarn in their stash. This is pretty much the dictionary definition of over-sharing. I don’t even know this poor woman. Why did I tell her all this?? Actually, the top is the better for it. It was definitely on the wide side. Maybe I’ll make it again and this time actually measure myself before I start. In fact – brainwave people! – maybe I’ll actually take all my measurements (before the 5pm Discarding Of The Bra ceremony obvs) and WRITE THEM DOWN so I actually know what size to make. Sheesh, this is like rocket science or something. My love for top down knitting knows no bounds. 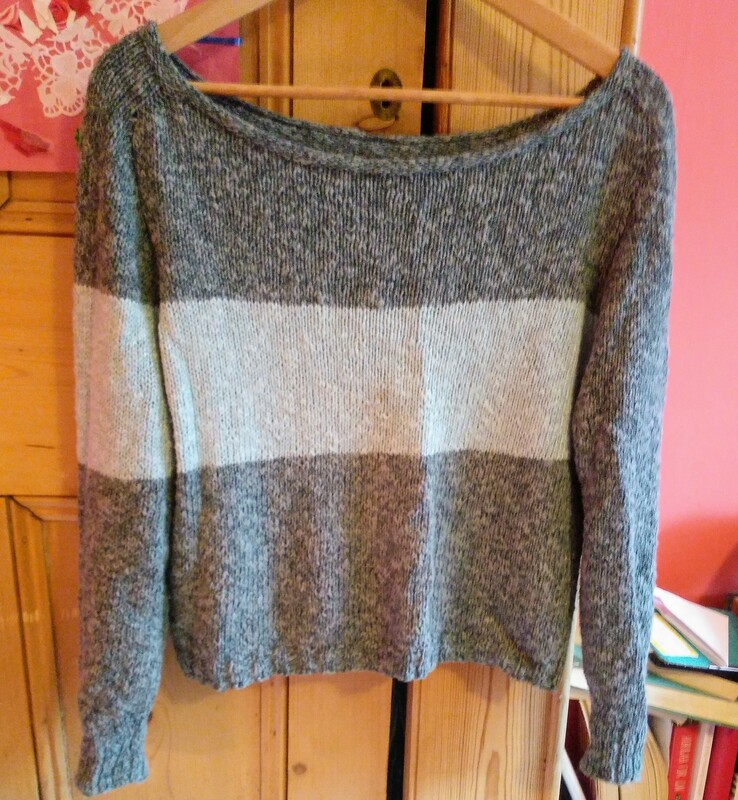 I am struggling to think of anything I’ve made recently that doesn’t arrive on circular needles. 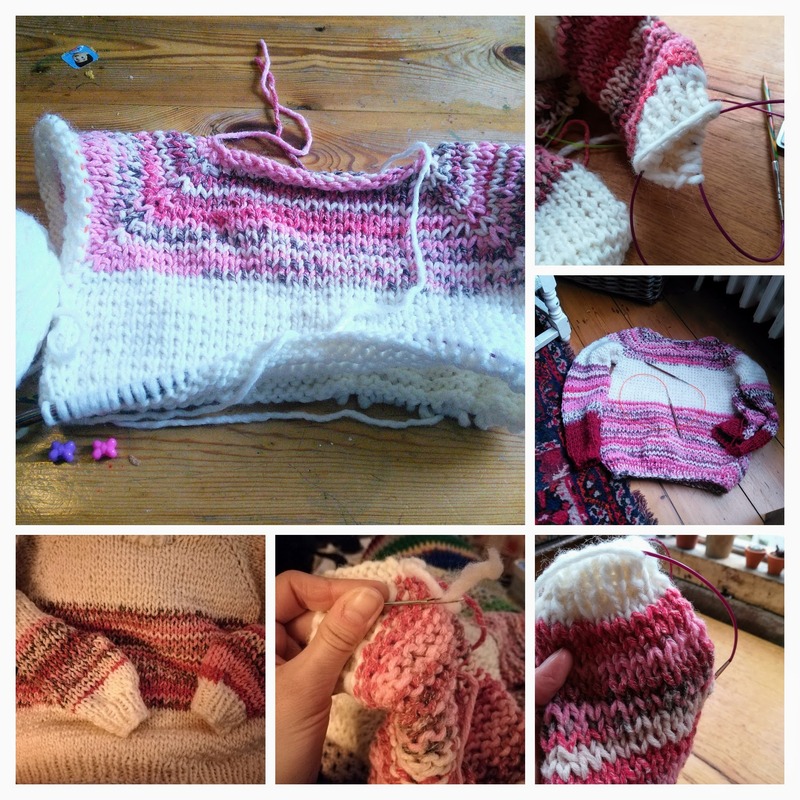 And yet, I actually don’t mind seaming stuff. I know many people consider it a giant ball-ache, but I find it quite satisfying. What I don’t like is keeping track of different bits and pieces. Even worse is the casting on, which is surely the devil’s work. I never get the length of the long tail right on long tail casting on techniques and I NEVER remember how many stitches I’ve done. A pox be upon it. Gosh, this update is becoming positively mediaeval in tone. Verily! Again, you beady-eyed types (why do you have beads for eyes, is what I want to know) will note that I clearly ran out of yarn for Cecily’s Bracken. She has red sleeves and collar. She didn’t mind, bless her beautiful heart. This is such a fun, quick pattern to make. I know a lot of people have problems with the neckline and it does take a while to get your head around. But, in fact, my problems have been slightly different. First the neck is just very tight even with a stretchy cast on. I actually ended up completely re-making my youngest’s Bracken. 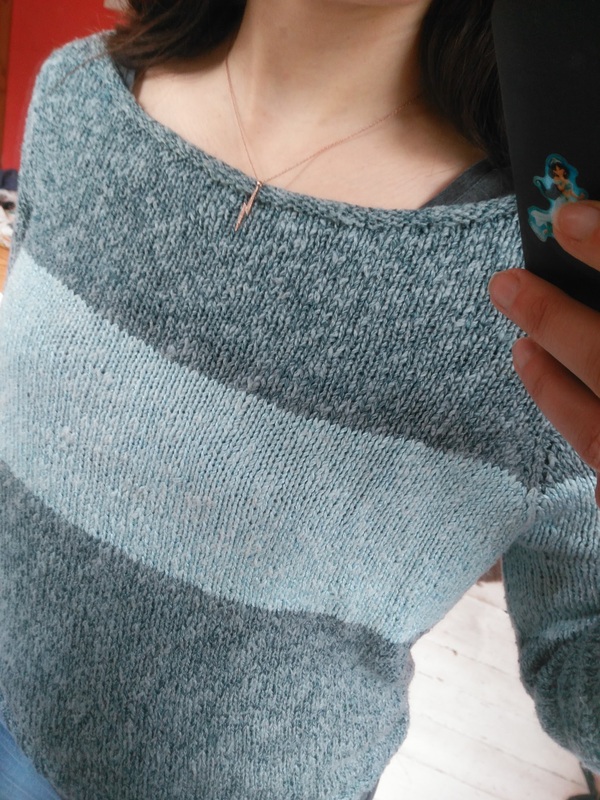 I tried to unpick it from the top neckline (ie what is actually the “bottom” of the knitting), got horribly confused and just had to weep gently while I frogged the entire thing. 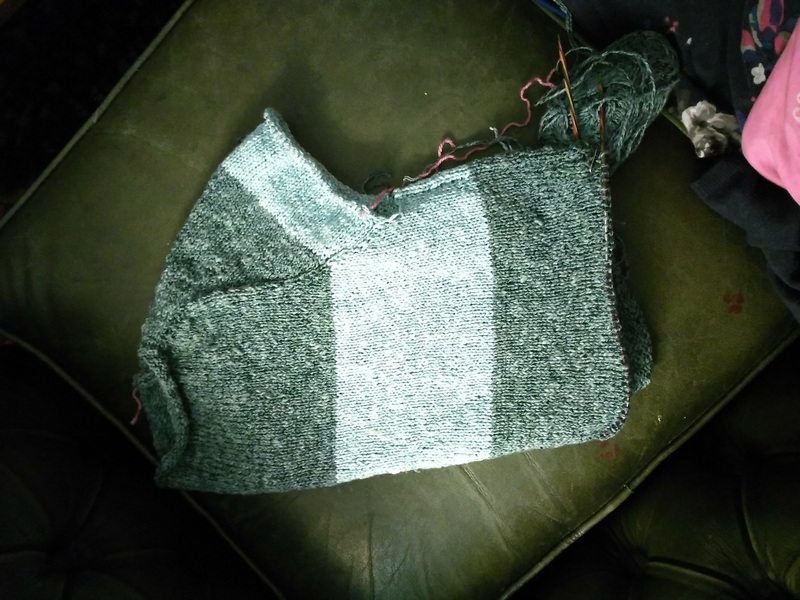 And second, I ended up with a very strange line of yarn across the front of the neckline where the extra stitches get cast on. I finally worked it out when I made my first one recently. I’ll share that exciting drama (and more!) in an upcoming post about the new one I’m making. For anyone stuck with the neckline instructions, I can also attempt a tutorial. I know you’ll be on the edges of your seats until then!